Johns Manville Formaldehyde-free™ fibreglass insulation provides thermal and accoustical control for both vertical and horizontal applications. Unfaced fibreglass insulation is available in a wide range of thermal resistance RSI/R-values. 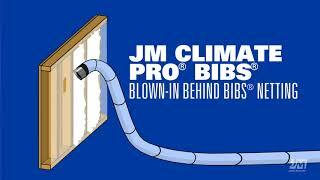 Handling hard-to-reach cavities and corners with more consistent coverage, Johns Manville Climate Pro® blow-in fibreglass insulation makes installation faster and easier. Johns Manville Climate Pro® Formaldehyde-free™ blow-in fibreglass insulation offers thermal and sound control along with fire-resistance. One bag of Climate Pro provides 4.5 square meters (48.9 square feet) of RSI 7 (R-40) coverage. Engineered for professional use with high-volume blowing machines, it's ideal for attics, nonconforming spaces and hard-to-reach areas making the job faster and easier. Thermally Efficient: Effective resistance to heat transfer. No settling; no loss of RSI/R-value following installation. Superior Performance: Stable bonded glass fibres will not slump, settle or break down during normal applications. Made for projects like wrapping small pipes, filling small cracks around windows and doors and sealing gaps around outlet boxes, Johns Manville Micro-Pak® is ideal for applications that require a minimal amount of insulation. Johns Manville Micro-Pak® Formaldehyde-free™ fibreglass insulation offers RSI 1.4 (R-8) and is designed for projects that require a small amount of insulation, such as filling gaps around windows and doors or wrapping pipes. Thermally Efficient: Provides effective resistance to heat transfer with an R-value of R-8 (RSI-1.4). Fire Resistant and Noncombustible: Flame Spread of 25 or less and Smkoke Developed of 50 or less. Non-corrosive: Does not accelerate corrosion of pipes, wiring or metal studs. Durable: Will not rot, mildew or otherwise deteriorate. Resilient: Bonded glass fibres will not pull apart during normal applications and resist settling, breakdown and sagging from vibration. Flexible: Forms readily around corners and curved surfaces. Forms readily around corners and curved surfaces. Designed to fill the dimensions of wall panels or roof cavities in pre-engineered metal buildings, Johns Manville Pan-Insul unfaced fibreglass provides excellent thermal performance. Johns Manville Pan-Insul unfaced fibreglass insulation is available in precut batts to fit standard cavities and in rolls that can be cut to fit any size cavity. Offering excellent thermal and sound performance, Pan-Insul is designed for long-lasting performance in the wall panel or roof cavity in pre-engineered metal buildings. Thermal Efficiency: Provides effective resistance to heat transfer with R-values up to R-25.4 (RSI-4.5). Durable: Unaffected by moisture, oil, grease and most acids. It will not rot, mildew or otherwise deteriorate. Resilient: Bonded glass fibers will not pull apart during normal applications and resist settling, breakdown and sagging from vibration. Flexible: Forms readily around corners and curved surfaces. Johns Manville PEBS Unfaced Filler Blanket Formaldehyde-Free™ insulation offers up to RSI 5.3 (R-30), with sound control and fire resistance for roofs and walls. PEBS is an economical, general-purpose fibreglass designed as filler material for use in both new construction and retrofits of pre-engineered metal buildings. It’s easy to cut with a utility knife and the blanket can be friction-fit easily in standard pre-engineered metal framing. Thermally Efficient: Effective resistance to heat transfer. Made to fit standard wood-frame or steel-stud construction, Johns Manville Sound-SHIELD batts are lightweight and sound-absorbent. Johns Manville Formaldehyde-free™ Sound-SHIELD fibreglass insulation reduces the transmission of sound through walls, floors and ceilings. It is available in batts to fit standard dimensions of wood-frame or steel-stud construction in residential, commercial, institutional industrial applications. Easily filling gaps with no adhesive or netting, Johns Manville Spider® Plus blow-in insulation uses interlocking fibre technology to fill all gaps and voids quickly. Johns Manville Spider® Plus Formaldehyde-free™ blow-in fibreglass insulation uses interlocking fibre technology to fill all gaps and voids quickly with no adhesive or netting for a faster installation. Spider Plus provides complete coverage, with no shrinking or settling, resulting in superior thermal performance and sound control. Designed for use in wood- and metal-frame construction, engineered- wood construction and manufactured homes. Fast Drying: Dries immediately once installed. Manufactured to be laminated to a variety of vapour barriers, Johns Manville UMBI® metal building insulation is a high-quality, highly resilient fibreglass blanket insulation. Johns Manville UMBI® Metal Building fibreglass blanket insulation is Formaldehyde-free™ with up to RSI 2.4 (R-14) and offers excellent noise reduction. Designed to be laminated to a wide variety of vapour barriers, UMBI can be used in roofs and walls of both new and existing metal building construction. Thermally Efficient: Provides effective resistance to heat transfer. Resilient Inorganic Glass: No rotting, mildew or deterioriation. Also noncorrosive to pipes, wiring and metal studs. Johns Manville Formaldehyde-free™ Unfaced thermal and acoustical insulation offers up to RSI 7.0 (R-50), and is offered in precut batts to fit standard wall cavities. Unfaced insulation reduces sound transmission through walls, ceilings and floors, and can be used in a variety of wood frame, engineered wood and steel frame construction applications, including new construction and retrofit. Thermally Efficient: Effective resistance to heat transfer, with RSI/R-values up to RSI 4.9 (R-28) for wood stud and RSI 7.0 (R-50) for metal stud. Fire-Resistant: Flame Spread of 10 or less and Smoke Developed of 50 or less. Superior Performance: Stable bonded glass fibres will not slump within the wall cavity, settle or break down during normal applications.